We keep the latest jobs in Bay, Gulf and Franklin Counties front and center. Our Job Fairs and other hiring events are always promoted in the events section of the site, and via our social media channels. Hot Jobs are shared, as well. All of our job listings are located at EmployFlorida.com, home of a powerful online tool specifically designed to help connect employers and job seekers. GKN Aerospace, the world’s leading multi-technology tier 1 aerospace supplier, is hiring for their new manufacturing facility in Panama City. Candidates with DoD government-granted secret security clearance are encouraged to apply. The company is hiring both salaried and hourly positions, plus there’s an excellent benefits package that includes medical/dental, company paid life insurance and disability, and 401k plan. GKN is now accepting applications through CareerSource Gulf Coast. Hiring events such as Job Fairs and Career Expos provide an opportunity to connect with companies face-to-face at CareerSource Gulf Coast or other locations. These events are designed for quick hiring. When scheduled, details will be posted here. Join us on Thursday, April 25th, from 9 am-12 pm at our 15th Annual Career Expo at FSU Panama City's Holley Center. Meet with local employers looking to hire in top industries and get a FREE professional head-shot! If you need help registering or updating your resume, stop by one of our offices in Bay, Gulf or Franklin Counties for personal assistance or attend a free resume workshop! View the schedule on our Events Page. For up-to-date information on employers and the Career Expo, click here or visit our Facebook. Thank you to our sponsors: Bay Chamber of Commerce, Panama City Beach Chamber of Commerce and WJHG-TV and its affiliates. CareerSource Gulf Coast will be hosting the 2nd Annual Franklin County Job Fair at our Apalachicola Office from 12 - 3 pm EST. This is a countywide job fair open to all businesses and job seekers from Carrabelle to Apalachicola. Job seekers bring your resume and be ready to meet face to face with multiple hiring employers. For more information, please contact 850-653-4981 or by email at vwebb@r4careersourcegc.com. 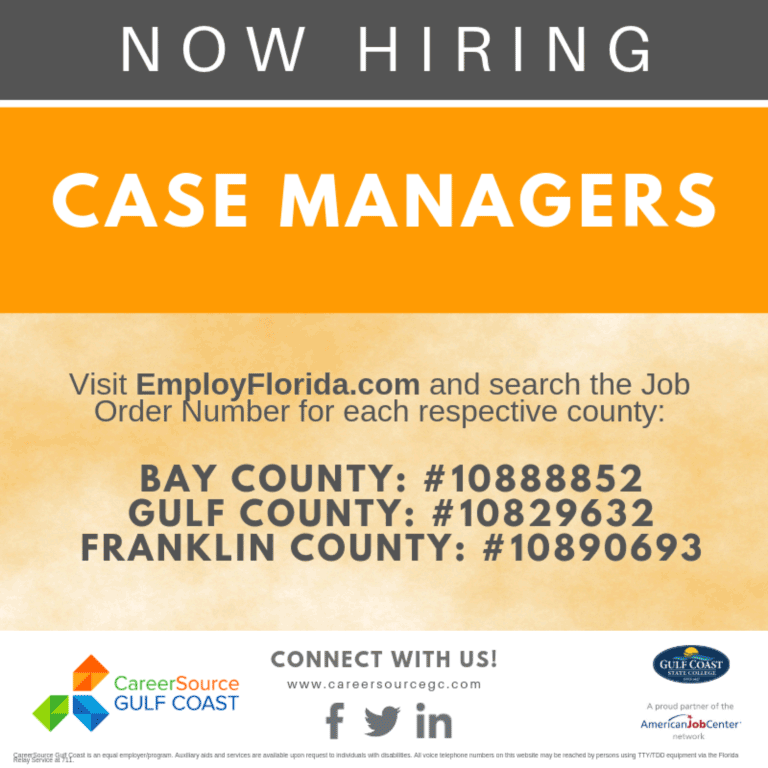 If you see a position of interest, visit EmployFlorida.com and search by the associated job number. This listing is also posted daily on our Facebook page.